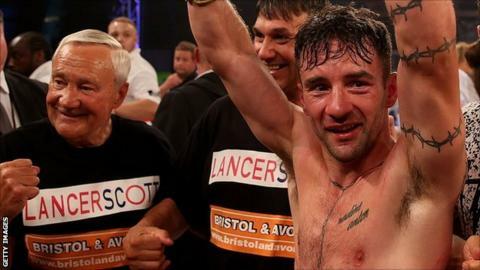 Bristol boxer Lee Haskins is to fight IBF bantamweight world champion Randy Caballero in the United States, his promoters have confirmed. Haskins, 32, won the interim belt in June with a sixth-round stoppage of Japan's Ryosuke Iwasa. He will now take on Caballero - who has not fought since October 2014 because of injury - for the title, although the date and venue are yet to be announced. "I'm looking forward to the challenge of boxing in America," said Haskins. He added: "I know this is a fight I can win. British fighters like James DeGale, Kell Brook and Amir Khan have proved that you can beat top American fighters stateside and I look forward to adding myself to that exclusive list." Caballero, 25, is unbeaten in 22 fights and beat Stuart Hall last year to claim the vacant IBF belt, while Haskins took his record to 32 victories and three defeats with his win over Iwasa. "After my last performance over Iwasa, who a lot of people said would beat me, I think the sky's the limit," he added. "Caballero is coming off an injury and 12 months of inactivity, against me that is a big mistake. "Now I just want to have that date and venue finalised so I can focus 100% on beating Caballero."